We encounter a lot of hypocrisy here at Truth About Fur, as it seems most anti-fur folk like bacon, wear leather, or think that synthetics don’t kill animals. (Tell that to the families of the birds that died in the Deepwater Horizon oil spill!) Today’s feature, the first in our Hypocrite series, is about one of the most hypocritical fashion designers we know: Stella McCartney. The list of Stella McCartney’s hypocritical actions is long. Let’s not start on the fact that her company is owned by the same company that owns Gucci, best known for its leather goods. Or that she has several homes and frequently flies around the world for work. That’s not good for the environment, is it? We also aren’t going to talk about the fact that Stella McCartney has acknowledged the popularity and beauty of fur by launching her own collection of (synthetic, tacky) fake fur pieces. She routinely uses synthetic materials that are not sustainable and are derived from petroleum by-products, whilst preaching about taking care of the environment. But that’s also not what we are talking about today. Today we are going to focus on silk. 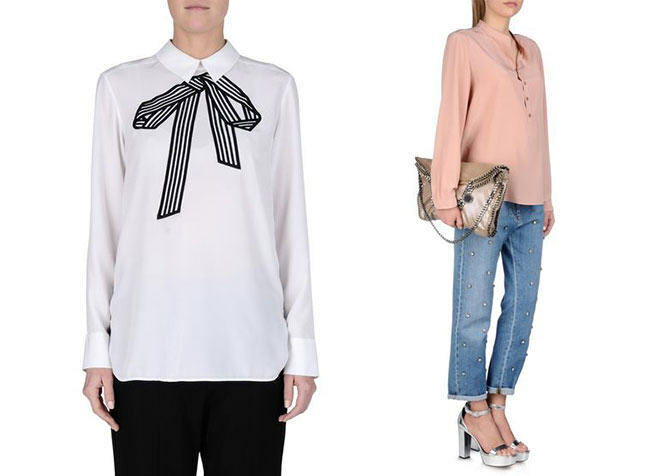 Stella McCartney’s silk blouses, made by boiling silk worms alive. Photos: Stella McCartney. The hypocrite: Stella McCartney, British fashion designer, lifelong vegetarian, and occasional spokesperson for PETA. However, Stella McCartney uses a lot of silk in her collections. Do you know how silk is harvested? Silk worms are boiled alive in their cocoons, allowing the long fibres to be extracted. This gets less media attention than fur because larvae aren’t as cute as mink and fox. Stella McCartney’s “fur free fur.” Why not just call it “ugly petrochemical coats” instead? Photos: Stella McCartney. What they say: PETA describes Stella McCartney as an “inspired and compassionate trendsetter” whose “award-winning collections are proudly free of leather, fur, and other skins.” Funny they didn’t mention that her collections include many garments made from animals that have been boiled alive. What we say: If Stella McCartney wants to make fashion collections without leather or fur, then that is fine. But can she please spare us the preaching about how the leather and fur industries are cruel to animals and the environment, when her own web store is stocked with garments made from non-biodegradable accessories and dresses whose fabric’s production process involves boiling animals alive? And if she doesn’t think that millions of animals should be killed “for the sake of fashion,” how does she explain all of the silk on her website? Is it because worms’ lives aren’t as valuable as minks’ or foxes’, or is it because Stella McCartney is a hypocrite? I think we all know the answer to that. Hypocrites rarely recognize their hypocrisy, but especially in Ms. McCartney’s case, I’m not convinced her intent is to hide what she’s doing. Instead of attacking her and branding her photos as if she’s some evil public enemy, how about just approaching her and having a discussion with her (online or otherwise)? Most vegans had a time in their lives in which they didn’t know what they know now. And even when they found out, not all made changes that day. Most probably didn’t change because someone got in their face and called them names, but because they read something, saw videos, etc…in the quiet of their room/office. Hi Kim, dialogue between people with opposing views is great IF it’s constructive, but when it comes to vegans vs. the fur trade, it’s too late for that, isn’t it? People like Stella McCartney want to shut our trade down, period. There’s no room for compromise, in her view. If you can suggest a way in which Stella and the fur trade might peacefully co-exist, we’ll certainly consider it. I think that its not wrong to use animals for food and clothing as long as its done in a responsible way. I guess the issue over fur began when I was a kid. I remember seeing fur seal pups being clubbed to death. My wife raised rabbits for their meat. She recalled hearing about a rabbit that was bludgeoned, but had not died. It came-to when the skinning was almost complete. They knew the mistake had been made when it began bleating. So for me personally, the issue is more about making the killing as humane as possible for the sake of the suffering the animal must endure. I have never used faux fur. I have been an avid hunter and I have tanned a good number of deer hides as well as small game hides. I find their fur to be beautiful, whether alive or dead. 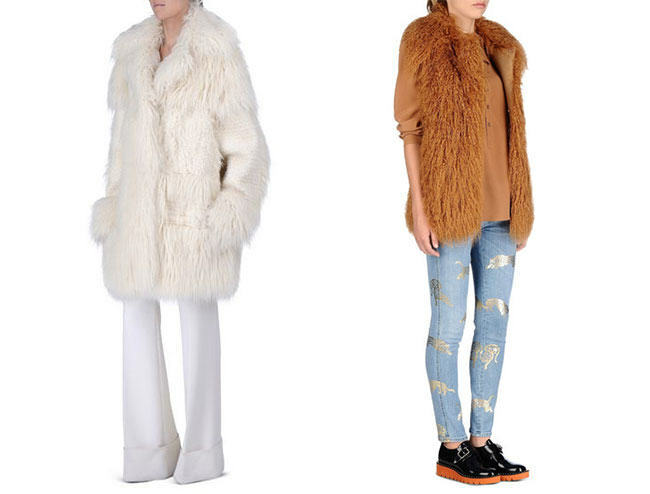 If I were to buy faux fur or leather it would be for budgetary reasons. I would love a real skin Parka. But I can’t spend several thousand dollars to obtain one. The history and current events in the commercial use of animal products frequently leads to the potential for extinction of some animals. But, If its done humanely and with consideration to conservation over market interests or profit; its not morally wrong. Sincerely Eric S. Revised comment. I find it ironic, you call animal activists bullies and criticizes their views, yet here you are labeling a woman, belittling her and insulting her fashion line because she wants something different. So what, she loves animals and see them as equal, you are superior and see yourself above them. Does two different opinions require childish name calling? Now hold on there, Kenny. It was Stella who started the name-calling. She’s been insulting anyone who uses fur for years. Maybe it’s payback time. But more importantly, given the title of our post, her hypocrisy is undeniable. She simply can’t, in good conscience, claim not to use animal products when she uses silk. It’s as simple as that. I have a question for all of you who call her a hypocrite for not creating biodegradable clothing: is every item in your wardrobe biodegradable? Is everything you eat, wear, or buy biodegradable? I’m talking socks, shoes, undergarments? I agree that a person shouldn’t preach about something they don’t do themselves. But to whoever wrote this post, and to all of the comments of people saying not all of her products are biodegradable, is every one of your belongings biodegradable? If not, then you are a hypocrite as well. Thanks for your comment, Monalisa, but Stella McCartney’s hypocrisy has nothing to do with whether her clothes are biodegradable. It’s to do with her opposition to the use of animal products in her clothes. She is inconsistent in her opposition because, as this blog post points out, she uses silk, which is produced from the larvae of silk moths, and involves killing the larvae. If you are against killing larvae, are you against killing human fetuses? Let’s see who is hypocritical. I’m afraid you seem to have missed the point of this blog post, Mary. Truth About Fur has not taken a position for or against killing larvae. But we are against a person who claims so stridently never to use animal products when in fact she does. As for abortion, that is a subject that we never allow to be discussed here. It is just too polarising. Sorry. Hi Freda, the debate will change greatly in years to come, as more environment-friendly materials are developed. What will be important to remember then is the positions taken today. Sure, sooner or later a plant-based alternative to silk will be developed, along with steak grown in a petri dish. But when Stella McCartney truly stops using all animal products, we hope people remember that for many years she lied about doing so. As Truth About Fur says, this article has nothing to do about biodegradable clothing, but to answer your question, I buy almost no clothing from synthetic materials. The only exceptions are the shell of my Canada Goose coat, some lingerie, and a bit of my children’s clothing. I beat myself up for buying them fleece but I have been unable to find a practical alternative for them as wool is a lot of work to take care of and can’t be machine washed. As for my non-clothing goods, not many of them are biodegradable, but I try and buy long lasting items that will not end up in a landfill very quickly. But this really shouldn’t matter, as this article is not about me. I don’t walk around preaching about fashion and telling people to do this and that, and I certainly don’t take the moral high ground when it comes to my fashion choices. Stella McCartney, on the other hand, does just this, and has focused her entire brand on the premise that they do not need to kill animals for “fashion,” yet she does just that with silk. That makes her, not me, a hypocrite. You all should cut the woman some slack. I am not condoning innocent creatures being boiled alive, but no human being is perfect. She is the only designer who is trying to provide fashion forward vegan shoes. And Simon makes a good point as well. Maybe we don’t know the whole story. Regardless, it’s very difficult to find vegan shoes that are attractive. Search the internet for vegan shoes. They’re awful and hideous. So thank you, Stella McCartney, you’re more evolved than the other designers out there. Also I’m afraid the fur look isn’t going anywhere, so you might as well embrace fake fur in the meantime as the best alternative. You can’t expect the population to go along with excluding the fur look altogether. Let’s be realistic. 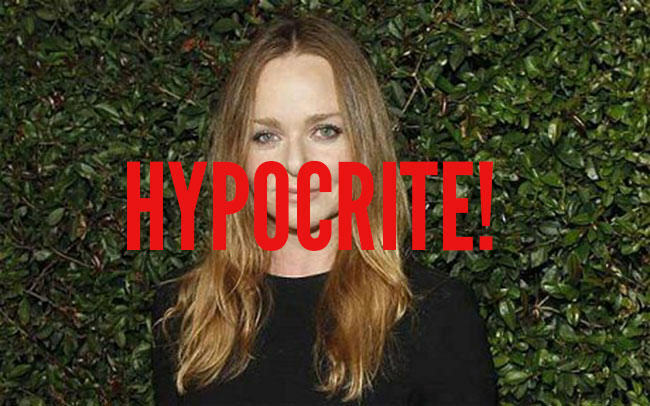 A fan of Stella McCartney who is a hypocrite? I am shocked! (Note the sarcasm.) Yes, people who are anti-fur could simply bypass the fur trend completely, it is not that hard. And while Stella McCartney’s vegan shoes might be more stylist that other brands, that doesn’t mean they aren’t going to sit in a landfill for 1000 years while all of the leather goods have biodegraded into the earth. Vegan shoes. I’ve heard it all. lmao. I didn’t realize shoes were a diet requirement. Sadly, this is who gets the most media attention to spill their ignorance. Backing for these are done by those who enjoy the ‘slight of hand’ media attention. I.E. look at this cruelty to animals, while I pollute their earth and treat human beings as less by horrible work conditions and little pay… Humans around the world have a great capacity towards compassion, sadly it is often misplaced by hype like that spilled through the media by those who are ignorant of reality. Being well known does not automatically make you knowledgeable about every topic. Everyone should remember this when listening to politicians, news, and, yes, even celebrities. One of the main problems with all these celebrity anti fur folks posturing is that the media, in the interest in selling their papers or radio or tv shows, recognise that there is more profit in simply regurgitating their ill-informed, ridiculous views than in doing proper journalism. From Stella’s geographically challenged father Paul through to Morrissey, Bryan Adams, Ellen Degeneres ad infinitum, not to mention all the “bought” politicians, these people get a free ride from the media regardless of the harm they inflict on workers in the animal usage business. The media should remember, and act on, the immortal words of Pogo: we have met the enemy and he is us. But of course they won’t as self reflection is not a media strong point. Unfortunately, this does not surprise me in the least. Most people you meet will act differently depending on who they are around. I completely agree that if you are not well educated in something it is best to leave off with the criticism and comments. Linda wore leather and fur in the 70s. She didn’t wear fur after the late 70s or leather after the late 80s. 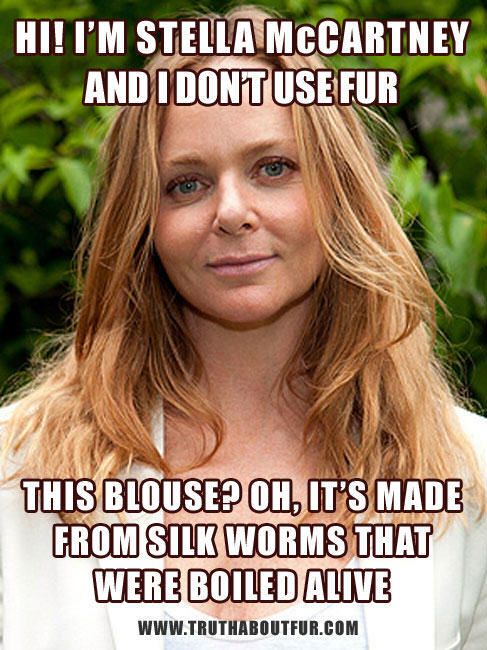 We should allow for the possibility that Stella McCartney is simply ignorant of how silk is made. I’ve met people who thought it was removed from cocoons like wool from a sheep! Remember Pam Anderson thought sheep didn’t die to make Ugg boots! Simon. She’s in the business. When you are in any business….You know where your materials come from…. I am in the business and I can tell you right now that not all designers know their supply chain in detail. If all designers knew exactly how their materials were sourced, we would have a very different industry.